Oil touched new lows on Thursday morning, with Brent crude sinking to its lowest point since 2010. Brent lost almost $US2 in the space of hours, and it is currently trading at $US80.56 a barrel. It was trading around $US100 a barrel just two months ago. 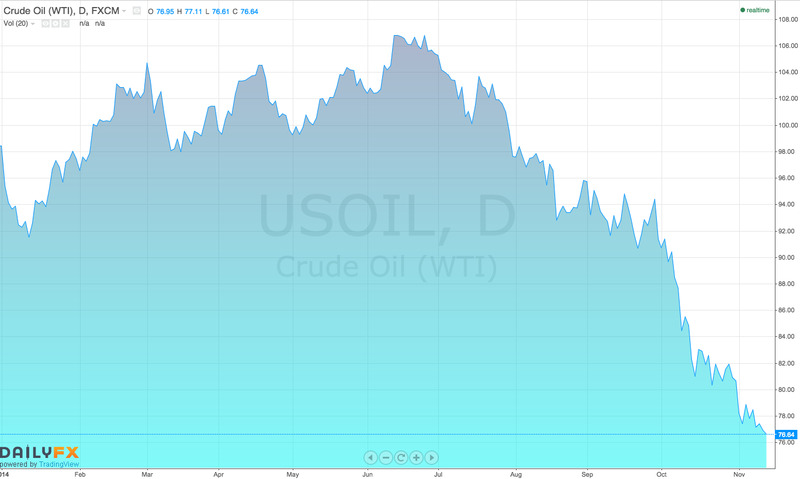 WTI crude suffered similar falls, dropping $US1 since from its high of $US77.88 a barrel this morning. 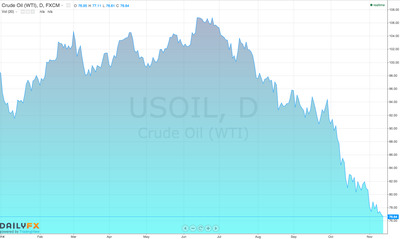 At the time of writing it is trading at $US76.81 a barrel. The collapse of oil prices over the last couple of months is a symptom of both demand shortfalls due to slowing growth in key consumer countries and supply shocks from the US shale oil boom to record supply from Russia. News this morning that industrial output growth slowed in China will do little to boost the oil outlook. All eyes are now focused on the next move of oil cartel OPEC, which controls 40% of global supplies. OPEC’s largest member Saudi Arabia has repeatedly dismissed rumours of a war on prices in order to combat the shale boom in the US, but the country faces a dilemma between cutting production to bolster prices or allow prices to continue to fall in order to regain market share. If OPEC does decide against cuts analysts from Societe Generale suggest that falling oil prices could act as a stimulus for the global economy. A $US20 decline in oil price adds 0.26% to the global GDP after the first year of shock, according their model.